You remember the children’s tale, Jack and the Beanstalk? It turns out to be a great metaphor for your corporate journey. You start out on the ground floor, and slowly, over time, you make career advances, just as Jack climbs the beanstalk. Over a period of time, through a step by step journey, you reach the clouds and find a castle. Inside the castle are gold coins, a hen that lays golden eggs, a magical harp, and other treasures. Mission accomplished, right? Yes and no. As you recall from the fable, there is a giant living in the castle who wants Jack’s “bones to grind my bread.” That’s the competition, representing companies that want to eat into your market share and aspiring professionals who want your job. So what’s the moral of the story? After spending years to reach the top of your career, you can’t rest, and you can’t take anything for granted. Sure, the view is nice and the creature comforts are first class, but there will always be giants trying to knock you off of your game. 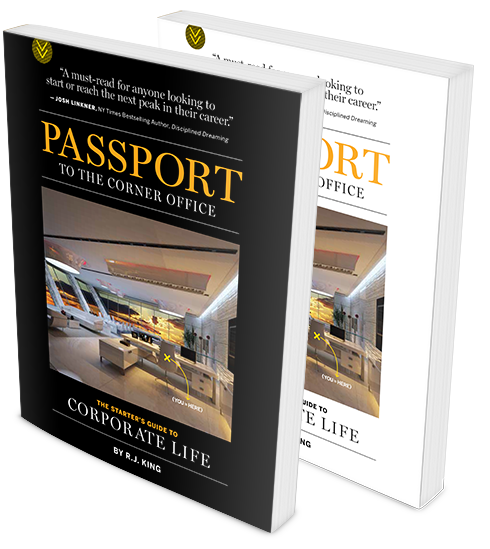 Back in the real world, Passport to the Corner Office offers you lessons to prepare for, and land, your first job. And once you’re at the ground floor, you’ll learn how to take positive steps to maximize your journey and reach your career aspirations. Lastly, and most importantly, the book provides meaningful tips for staying on top. Quite frankly, you can never rest on your laurels. Standing still is never an option, even in retirement, where you may be asked to chair and turn around a struggling theatre company or a mismanaged opera house. At the end of the day, it’s not about the destination, it’s about the journey. In life, you have to spend every day blazing your way to that next castle. But once you get there, don’t get comfortable. There’s always another adventure right around the corner.